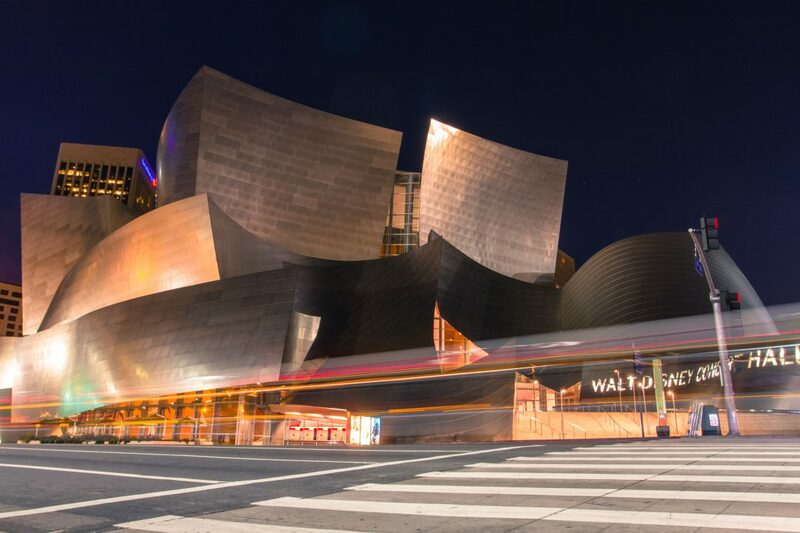 Frank Gehry Timeline: 8 Game-Changing Buildings in L.A.
Home Celebrity These 8 Buildings Explain Frank Gehry’s Influence on L.A.
Frank Gehry is among the best-known–and perhaps most controversial–architects of the last 100 years. His unmistakable structures, often defined by bold geometries and materials, are either icons or eyesores depending on your taste. And while we may continue debating his buildings for generations, there’s no denying his influence. Los Angeles, Gehry’s longtime home, is as much a living museum of his legacy as any city in the world. His first design was constructed in the region in 1957, and now, 62 years later, he has multiple new projects in development. In honor of his 90th birthday, here’s a quick tour of some of his most game-changing structures. Designed in the late ’60s and completed in 1972, this private residence was one of the first to show what would become Gehry’s signature style. Note the corrugated metal cladding and asymmetrical shape. Purchased by actor Patrick Dempsey in 2009, the home was destroyed by the Woolsey Fire in 2018. Frank Gehry’s own private home in Santa Monica was a place for him to play with some ideas that might have been too experimental for other clients. He started with a 1920 bungalow, and then expanded it and wrapped the whole structure in new materials. At the time, his neighbors weren’t that into it, but now it’s accepted as a Westside architectural destination. This aquarium from relatively early in Gehry’s career isn’t visited as often as some of his other public works, but is worth seeking out for its interesting metal slat-covered facade, which transforms an otherwise fairly conventional, low-slung structure into something a bit more evocative of the waves and aquatic life contained within. The Goldwyn Hollywood Regional Library accomplishes an interesting feat: it’s both “fortress like” in shape, yet incredibly light and bright. The glowing glass cubes soak up the sun and create a space for books and culture that still looks modern decades after completion. By the late ’80s, Gehry was an established name in architecture. This beautiful, blocky home in Brentwood expresses design elements that would also appear in other projects, from the Hollywood Regional Library to his forthcoming Grand Avenue complex. Construction on this office building, commissioned for the advertising agency now known as TBWA\Chiat\Day, lasted from 1991 to 2001. And Gehry had an interesting note: to incorporate the massive-scale public artwork Giant Binoculars by Claes Oldenburg and Coosje van Bruggen into the facade. In 2011, Google took over most of the offices inside. People used to joke that the Hollywood Sign was L.A.’s only landmark, but that was before the Walt Disney Concert Hall opened its doors. The swooping, silver structure is unmistakable and became an instant icon. Gehry would echo the shapes and motifs of Disney Hall in structures from Chicago’s Pritzker Pavilion to MARTa in Herford, Germany. Even at 90, Gehry is still helming major new developments. The Grand, a huge mixed-use complex which will sit on a lot across from the Disney Concert Hall just broke ground last month. Like the concert hall itself, the project has been met with some criticism, for both its style and scale. Either way, it will be a major feature of DTLA for years to come. Previous articleA Play About LeBron James Is Coming to L.A.